You can attract more visitors to your website by creating content based on the conversations you track online. 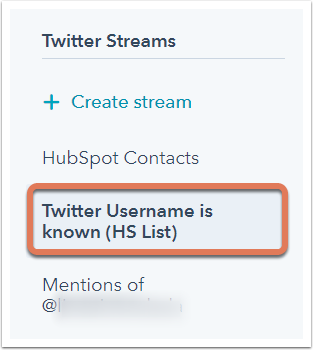 Twitter streams are the searches that HubSpot uses to monitor conversations on Twitter and display them in your social monitoring tool. In addition to creating your own stream, you can view streams of your timeline, mentions, retweets, and sent messages. In the left sidebar menu, under Twitter Streams, navigate to Create stream. In the upper left, enter a Stream name. All of Twitter: HubSpot will search and listen to tweets from everyone on Twitter for any of the words you choose. 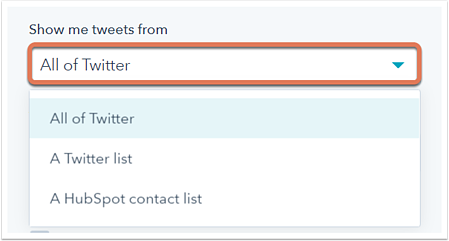 A Twitter List: HubSpot will search and listen to one of your Twitter lists. A HubSpot contact list: HubSpot will search and listen to one of your HubSpot lists. Enter one or more keywords to listen for in the That contain field, and use commas or tabs to separate multiple keywords. If you enter more than one keyword, a tweet will be included in your stream if it contains any keyword you have entered. Please note: Twitter streams use Twitter's search API to return results. 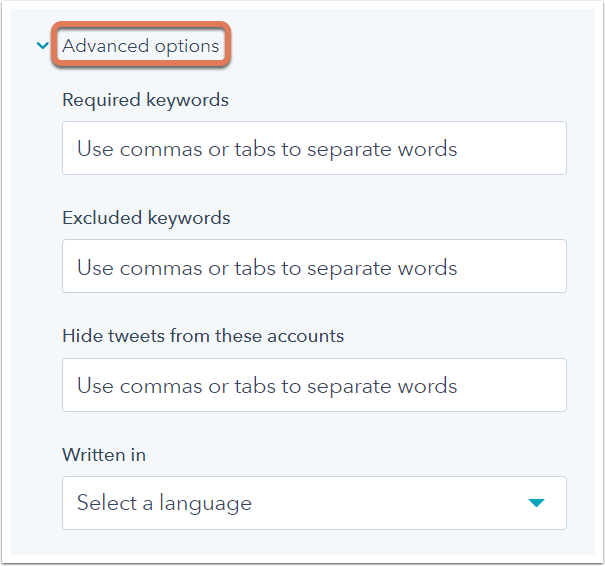 Twitter recommends limiting your searches to 10 - 15 keywords, and Twitter streams with keywords above this limit may not work. Required keywords: your stream will only return tweets that include the keywords entered into this field. For example, if you had a stream monitoring for the phrases ice cream and frozen yogurt, you could add a required keyword of free to monitor for any tweets about free ice cream or free frozen yogurt. Exclude keywords: your stream will only include tweets that do not contain this keyword. Using the free ice cream example, adding sorbet as an excluded keyword would exclude any tweets that also mentioned sorbet. Hide tweets from these accounts: your stream will exclude tweets from accounts that you add here. For example, you could use this option to filter out the tweets from your own employees. Written in: your stream will include tweets that meet your criteria, but only if they are tweeted in the language that you select here. Set up your stream to notify certain recipients when matches occur, such as your marketing team. 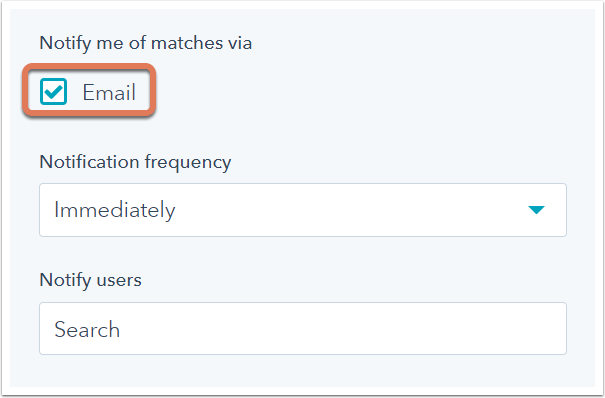 To select when the notification email should be sent, click the Notification frequency dropdown menu: Immediately (as soon as matches are found), 8am, or 8am & 4pm. To select users in your account who should be sent the notification email, click the Notify users dropdown menu. Once you've created your Twitter streams, you can manage them by editing or deleting them. In the left sidebar menu, navigate to a Twitter stream. At the top, click Edit next to the stream name. Edit the various options on the left side of the stream. When you're done, click Save in the bottom left. At the bottom, click Delete stream. You can reply to, retweet, or quote tweets in your Twitter streams as if you were reacting natively on Twitter. To reply to a tweet, click Reply at the bottom of the tweet. In the text box that appears, type your reply and click Reply at the bottom. To retweet a tweet to send it to your follower base, click Retweet at the bottom of a tweet. To quote a tweet, click Quote at the bottom of the tweet. In the composer panel, add your own content to accompany the original tweet. In the bottom left, click Publish post now (or Schedule post).